Did The Walking Dead Finale Introduce The Whisperers? The Walking Dead's season 8 finale might have eliminated the threat of Negan and the Saviors, but it also may have introduced a brand new threat: the Whisperers. As the Hilltop survivors prepared to do battle with the Saviors, they spotted a herd of walkers on the horizon that's bigger than any they've seen before. The Whisperers are a faction that survive by covering themselves in the skins of walkers and walking with the herds in order to stay camouflaged. In the comics, the Whisperers take over as the main antagonists shortly after Rick cuts Negan's throat and take him prisoner - which is how their conflict concluded in the finale. The Walking Dead showrunner Scott Gimple recently confirmed that the Whisperers will appear on the show, though he didn't specify exactly which season we can expect to see them in. Since the show has so far roughly followed the same arc as the comics, however, it's a pretty safe bet that the massive herd spotted in the finale heralds the arrival of the Whisperers. If that's the case, then the Whisperers could be exactly what The Walking Dead needs to get back on top. 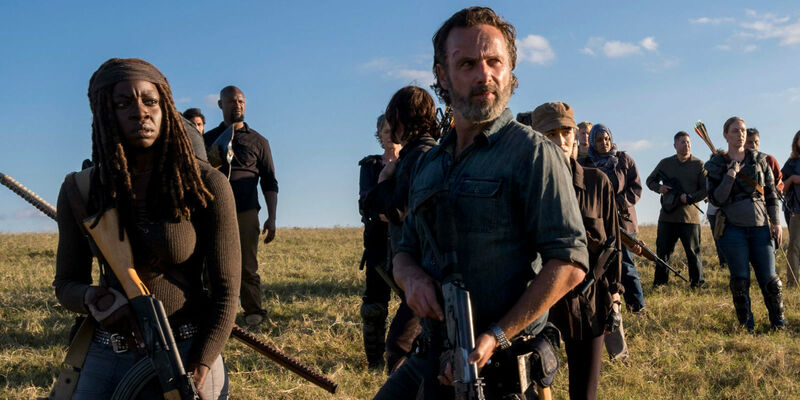 Season 9 will see veteran Walking Dead writer Angela Kang take over from Gimple as showrunner, and the Whisperers would offer her excellent material to work with. The war with the Saviors meant fighting a very human enemy that favored all-out assaults with assault weapons. Meanwhile, the walkers themselves have become somewhat diminished as a threat, with characters casually dispatching them after years of practice. But with their ability to disguise themselves as stupid, shambling zombies, the Whisperers can catch survivors off-guard and then disappear back into the horde - making them a deadly threat of a kind that Rick and co. have never encountered before, and won't be ready to deal with. Right now, things are looking as peaceful as can be hoped for in a show like The Walking Dead. Negan is going to have the honor of being the first criminal thrown in Hilltop's jail, Rick is determined to build a new civilization, and former Savior Al has offered to use the "Key to A Future" guidelines to provide Hilltop with more advanced technology. Admittedly there is already trouble brewing, with Maggie recruiting Jesus and Daryl into her plan to kill Negan, but otherwise the survivors seem to have a clear roadmap back to civilization. So, naturally, something is going to arrive to disrupt those plans - and what better challenge than the "talking dead"? In the comics, the Whisperers are led by a woman called Alpha, who is arguably even more evil and savage than Negan himself, so it will be worth keeping an eye on casting news for The Walking Dead season 9. If this new herd of walkers is bringing the Whisperers with it, or if they arrive by some other means, then Alpha could prove to be a terrifying new enemy in season 9 - an enemy that Hilltop might not see coming until it's too late. The Walking Dead season 9 is expected to premiere in fall 2018.